Whoever has been living under a rock for let’s say the last couple of years and hasn’t ever heard anything about the online platform Wikileaks will have trouble understanding what the film „The Fifth Estate“ is all about. And whoever thought that the film will take revenge on Wikileaks‘ founder Julian Assange, will be disappointed. Director Bill Condon concentrates his work on the relationship between Julian Assange and Daniel Domscheit-Berg. And if this isn’t enough to get along with – you know that Assange wasn’t amused when works for the film started – „The Fifth Estate“ tries to make things visible that are not visible: Websites, Mails, Chats, Computercodes and a lot of other tech-stuff most of the public has only a faintest idea of what those things are really made for. And so there are many flashing lines, different windows on computerscreens (they often work on Thinkpads by the way for anyone interested), a huge sterile looking office, an empty snow covered field, with a few camp fires and people hovering before their laptops when they are not too busy traveling round the world. Benedict Cumberbach – who was the baddie in the latest Star Trek film, is about to be Alan Turing in the film „The Imitation Game“, will hit the cinemas in „12 Years a Slave“, „August: Osange County“ and gives voice to the dragon Smaug in „The Hobbit“ before Christmas (and we all are desperately waiting for him bringing Sherlock back to our telly) – Benedict Cumberbatch is hardly visible as a person. Because he does what he always does as an actor: getting under the skin of the figure he is about to play, stepping totally aside and bringing the character to life with the brilliance of an actor who is said to be one of the best of his generation. His white hair, his totally changed face, contacts that cover the natural colour of his eyes is combined with totally unfamiliar gestures, reactions, different body language what all together helps Benedict Cumberbatch really being Julian Assange, at least the Assange of this film. A restless, hounded, highly intelligent computer expert who is at the same time lonely, isolated and very fascinating, who brutally pisses off his best and trusted friend although he earns him so much. „All I have got is a webside, a couple of fake email addresses. And you. Do I have you?“ Assange asks Domscheit-Berg at the beginning. „If you want the truth, you’ve to seek it out for yourself. That’s what they’re afraid of. You.“, the fictional Assange says in an fictional interview that’s wrapped around the film. The film – like in real life – he accuses of being an attack on himself and Wikileaks. But the film isn’t an attack at all. Partly based on the memories of Daniel Domscheit-Berg (who supported Daniel Brühl in his preparation for the role) and taking his point of view, the film can not be objective or even a documentary. 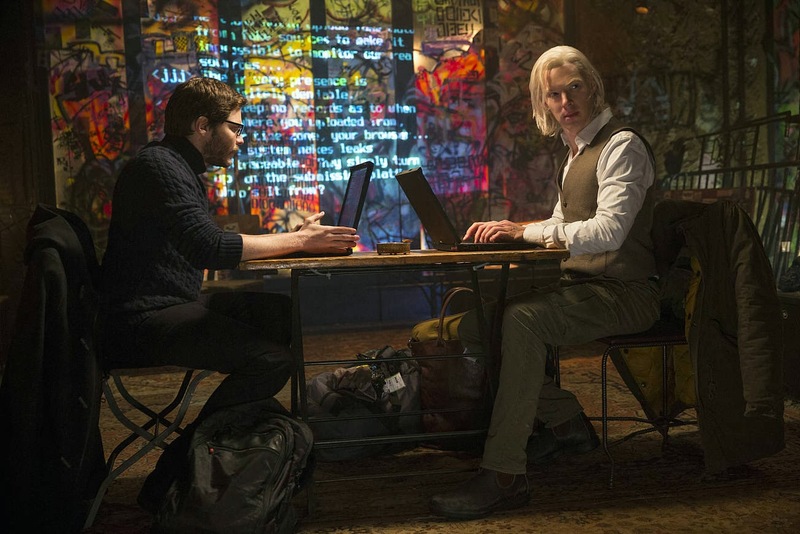 „The Fifth Estate“ is above all a good and thrilling entertainment. And maybe it will get some to find out more about Julian Assange and Wikileaks.